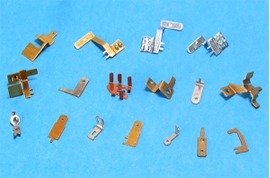 We are Manufacturer, Supplier of precision pressed parts used in automobile electronics and electrical assemblies. Our experience, quality, On time delivery, cost effectiveness, productivity makes us a leading source for our customers and their products. 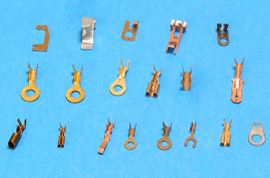 We manufacture in large and small quantities, in all shapes and forms, in all kind of materials from copper, brass, aluminum, steel to spring steel. We invest in technology, process improvement, raw material saving techniques, quality enhancement, and cost reduction to transfer the advantages to customer’s end product. DIN Standard Terminals For Electronics And Electrical Wiring Harness in automobile and electrical applications as per customers drawings. 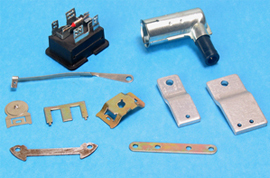 Aluminum Stampings and Forms used as heat sink for auto electronics parts like regulators, cdi units. 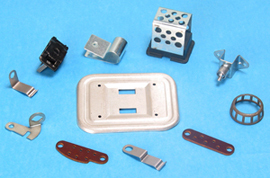 Precision Terminals / Pins used in insert plastic or Bakelite moulding of electronics assemblies. We also manufacture specific products used in agriculture equipments, food industry, furniture industry and goldsmith machinery- application industry.